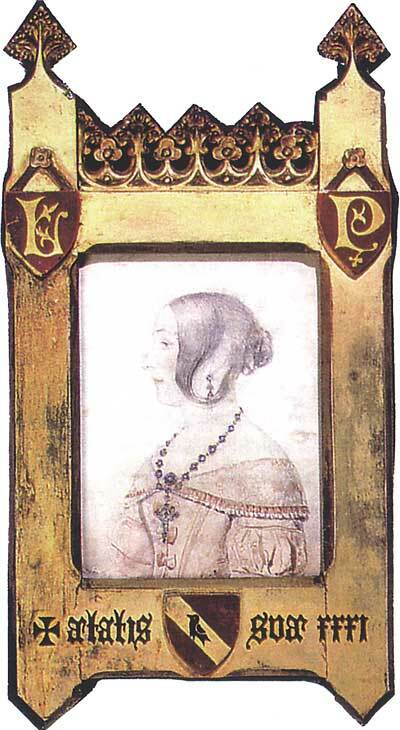 Pugin married Louisa Button, aged 20, in 1833. Uncertainty exists surrounding her surname; some sources use 'Burton' instead as it appears of a higher social standing although official records record the less-elevated 'Button' as being correct. Little is known about Louisa. In God's Architect, Rosemary Hill notes that 'almost every trace of Louisa has disappeared' and suggests it is 'likely, though not certain, that Pugin himself destroyed their correspondence.' Recollections and comments by those associated with Pugin provide glimpses of Louisa's background and character. Pugin's childhood friend (and eventual biographer) Benjamin Ferrey suggests that Louisa came from Salisbury which is why Pugin chose to move there, building St Marie's Grange nearby. Ferry also suggests that, like Pugin's first wife, Louisa was associated with the theatre and that their union was not the wisest of decisions for the young widowed Pugin to make. She was short, broadly but compactly built, quick in her movements, and with that peculiar grace which is the result of perfect freedom of action; her features were clearly cut and regular though not refined, her eyes brown and sparkling with god humour when pleased, but of that kind appears [sic] to become almost black when angered, her eyebrows well marked and slightly tightened to the front, it might be with occasional fierce temper, her nose straight and rather pointed with delicate open nostrils, her mouth small well arched with thin and expressive lips, her forehead and cheeks smooth with an observable artificial bloom on the latter. Louisa was not a Catholic when she and Pugin married in 1833 and it wasn't until May 1839 that the Reverend Daniel Rock received Louisa into the Catholic Church in the chapel at Alton Towers, the home of Pugin's wealthy Catholic patron Lord Shrewsbury. As well as being a stepmother to Pugin's first child, Anne, Louisa and Pugin had five children: Edward, born 1834, Agnes, born 1836, Cuthbert, born 1840, Katharine, born 1841, and Mary, born 1843. In 1838, possibly due to the growing nature of the family, the Pugins moved from St Marie's Grange, Salisbury, to No. 42 Cheyne Walk, Chelsea, London. On reaching the cathedral, the body, which had been carried on the shoulders of eight brothers…was placed under a hearse or canopy, elevated to the height of fourteen feet, and beautifully ornamented with rows or clusters of candles, which crested and pinnacled the entire fram-work. On the back and front and along the sides of the canopy were arranged the escutcheon and other devices of the deceased; the torches also, carried by six boys, and the candles which were burned around the coffin in great numbers, being emblazoned with the same. High Mass was sung and the usual ceremonies were performed, and the body was again carried in procession to a chantry chapel in the crypt.... the chapel which contains the coffin is shortly to be decorated in the style of the middle ages, and a suitable tomb to be erected. Following his wife's death, Pugin wrote to Lord Shrewsbury, explaining how 'I must make immediate argments [sic] for getting rid of my house at Chelsea & moving my things for I can't bear to return to or remain in it.' Indeed, in his correspondence over the next few years before meeting his third wife, he often remarked how '[I] miss my wife at every turn. I hope time may remove this but at present it is almost insupportable.' Pugin also wrote that, once construction is complete, he intends to inter his late wife within the family vault at St Augustine's church. However, this never took place and she remains at St Chad's Cathedral.